If you watch science fiction movies, the robots of the future look like us. The truth is, though, many tasks go better when robots don’t look like us. Sometimes they are unique to a particular job or sometimes it is useful to draw inspiration from something other than a human being. One professor at Johns Hopkins along with some students decided to look at spider crickets as an inspiration for a new breed of jumping robots. Producing micro robotics is not yet easy or cost-effective, but why do we need to when we can just control the minds of cockroaches? A team or researchers from North Carolina State University is calling this augmented Madagascar Hissing cockroach an Insect Biobot in their latest research paper (PDF). It’s not the first time the subject has come up. There have already been proofs in research and even more amateur endeavors. But the accuracy and control seen in the video after the break is beyond compare. The roach is being controlled to perfectly follow a line on the floor. One of the things that makes this iteration work so well is that the microcontroller includes a new type of ADC-based feedback loop for the stimulation of the insect brain. This helps to ensure that the roach will not grow accustom to the stimulation and stop responding to it. Since this variety of insect can live for about two years, this breakthrough makes it into a reusable tool. We’re not sure what that tool will be used for, but perhaps the next plague of insects will be controlled by man, and not mother nature. [Fotoopa] keeps churning out new iterations of his laser-triggered camera rig. This is his latest, which he calls the 2011 setup. Regular readers will remember that we just covered a different version back in November; that one was the 2010 rendition. It had two DSLR cameras offset by 90 degrees with mirrors to face forward. This time around he has gone back to the single camera setup which was what he used on the first and second versions seen way back in 2008. Whew, that’s a lot of links to specialty DSLR hardware. Let’s bring it back to this newest model (the link at the top). The biggest improvement is the shutter delay between when the laser beam is tripped and the image is take. [Fotoopa] reports that he’s managed to reduce that time down to 3.3 milliseconds. This is thanks to an external shutter replacement which improves on the stock shutter’s 52 millisecond delay. For those that are seeing this for the first time. 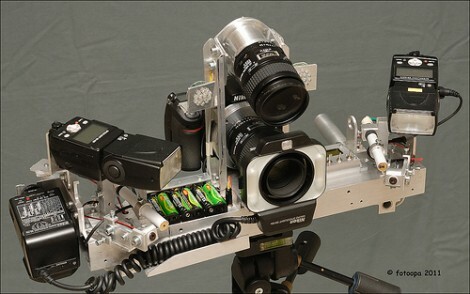 [Fotoopa] uses this rig to photograph insects in motion. A laser trip wire is responsible for triggering the shutter, and it does so with stunning results!